Well, I live in a small city in Sweden, not too much to do around here, one of those places where it's preferable or even vital to have some very time-consuming hobbies I'd say! I'm self-taught when it comes to 3D modelling and graphics (and I'm still learning). I've not worked with graphics/3D professionally apart from a bit of freelance work on some smaller indie titles (Kenshi being one of them). To many modders out there your username has become synonymous with all sorts of flora overhauls for different games. How would you describe your work in your own words? Basically, it's just about trying to make a game that I enjoy myself more immersive graphically. It usually starts with me making a tiny modification to graphics for myself. It can be just a texture that I find distracting or "off". Sometimes this expands into something larger and I start remodelling trees etc. and then it can be released as a mod if I feel that others might enjoy it, too. What is it that makes you gravitate towards grass, trees, and flower overhauls? When I started no one else was doing these mods really, so if you wanted it there was no way around it other than to create it yourself. I think I've always had a genuine interest for, well, trying to recreate nature in some form. As a kid, I loved doing dioramas that involved nature and when I - for a while - was into drawing and painting my first choice was nature as well. 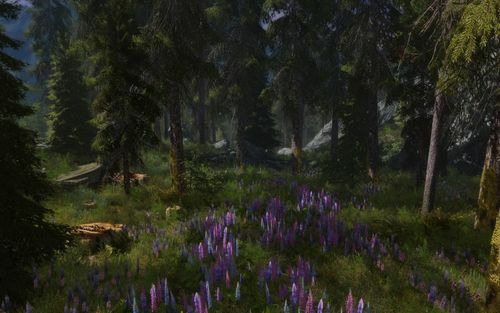 You have created some of the most downloaded flora overhauls for various games: Skyrim, Fallout New Vegas, and Dark Souls - to name a few. Are there any significant differences in your approach when creating mods for different games? It's pretty similar: extract models and textures from the game and have a look at them for a bit (you can learn a lot by just looking at these resources!). Then recreate them to your taste in Photoshop and model it all in Blender. Profit! I try to not stray too far from what is already established thematically for the games, but sometimes it's fun to make something else entirely. For Fallout 3 I created an overhaul with healthy green trees and flora and it's been very appreciated. What would you say is your favourite mod of the ones you have created and why? 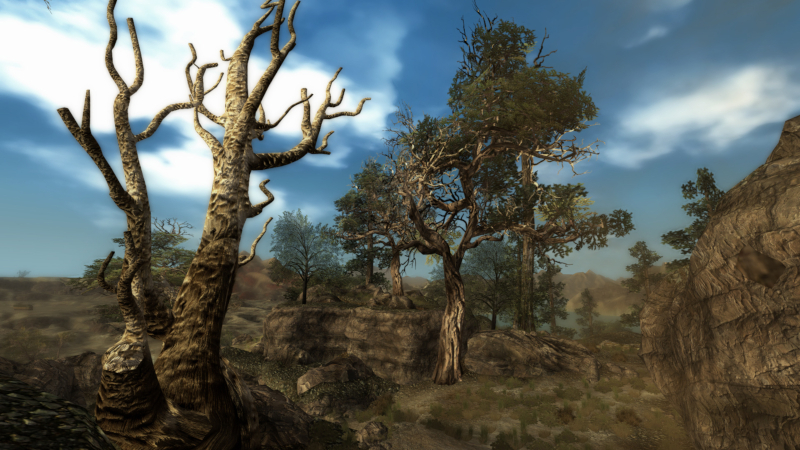 That would probably be Wasteland Flora Overhaul for Fallout: New Vegas because I had such a great time making that mod. It was my best learning experience, too. I made tons of tree models for that mod and I had to approach them very differently. Doing the Joshua trees and Yucca plants took a while to figure out. I decided early on that the bark could not just be the usual repeating 2D texture slapped onto a trunk, it just didn't catch what those trees are all about. To this date, I'm still very happy with them, and that is very rare for me. The flora there is very different from what we have here in Sweden, so, yeah, very exotic and interesting to me. I had to research a lot and I had to figure out how to make a dead place a bit more interesting, but without going totally over-the-top. What was it that initially inspired you to create flora overhauls of all things? Morrowind started it all. I hadn't played it in many years and went back to it and I decided I wanted some mods. I installed the Morrowind Graphics Extender and it really blew my mind. In fact, so much that I stopped playing completely and just started downloading mods (anything that improved graphics) and grabbing and sharing screens because I thought it looked so amazing. Though the two things that stuck out like a sore thumb was the short and low-poly trees and there was no groundcover either, like in modern games. Modders just didn't seem to have too much interest in that part. So I started looking for mods that did at least touch on the subject of flora to see how they were done, and what I could do to perhaps improve or expand upon it. I was hoping to be able to contribute to the Morrowind modding community because I was both very inspired by its immense creativity and at the same time also really thankful to the community as a whole for creating all those amazing mods. I really didn't expect my mods to be very popular. The modder Vality should not go unmentioned either, he was a great inspiration and help to me during the first year or so. What would you say are the main things you have learned during years of modding for different games? References are super important, don't be over-confident, or ashamed to use references. There's a reason why big studios have concept artists. Do your own concept graphics or use google to find images to use as references. In the beginning, I was very lazy with using references, so if something turned out good and natural looking it was pure luck. It's time-consuming and not good practice to not use references. Another important thing is to take breaks when it's just not fun or inspiring anymore. Days, weeks or months until it feels inspiring and fun again, or you might kill off your hobby completely because it becomes associated with stress or just bad feelings overall. I'm still on kind of a long break from modding, apart from doing some small mods like the Groundcover Overhaul for STALKER: SoC. What are some games you are currently playing? Red Dead Redemption 2 and Spiderman on PS4. On PC I play Rimworld (GOTY together with RDR 2 for me!) and STALKER: SoC with the Radiophobia mod. I'm quite terrible at finishing anything though. I recently also bought Shadow of the Colossus, I'm really eager to see how the natural environments are done there - might be inspiring! Do you have any favourite mods for the games you are playing? It's hard to single out specific ones, but I appreciate any modder that does stuff that no one else seems to be doing because it's too boring, too complicated, or it's something you might think will not generate a lot of interest. 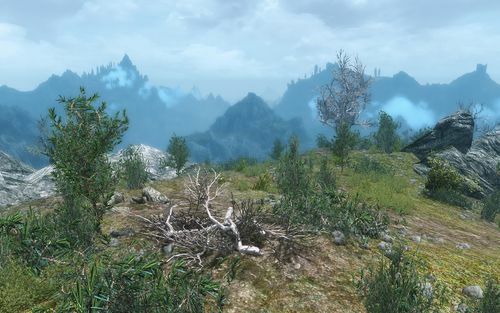 Much like anyone who is playing Skyrim I can really appreciate a mod like SkyUI for example. To me, something like that seems unbearably complex to create. I 'm glad there are modders who do this kind of stuff. I also appreciate modders that don't move on just because a game is getting old and there are newer games to mod that might generate more interest. What are some of your hobbies outside of gaming and modding? For the last few years, my biggest interest has been modular synths. Doing electronic music was what sparked my creativity when I was in my teens. I bought some cheap synths and I already had an Amiga. Later on, I switched to PC, and much later on (late 90s) I went 100% software using PC. Now I'm back to 100% hardware for doing music, no computer even. I find it way more fun than to work with a mouse in software, and it's nice to get away from Windows/PC for a bit. Last but not least: Is there anything else you would like to say to the Nexus Mods community? I'd like to say thanks for all the nice comments that I've been receiving throughout the years from users of my mods. They've meant a lot to my confidence and my will to continue to create mods! And why not a thank you to Robin Scott himself for such a great and thought out modding portal! It seems like almost any new and old game gets added to Nexus nowadays, that's great (and now I just reminded myself that I've yet to upload my System Shock 2 and KOTOR mods here). Take care all, and have fun! A big thank you to vurt for answering our questions. As always, if there's an author or mod project you'd like to know more about, send your suggestions to BigBizkit or Pickysaurus. I wax lyrical about your flora overhaul mods so much that any time my partner sees an interesting tree in a Bethesda game we're playing, she'll ask if it's "one of that tree guy's mods". I think your New Vegas and Morrowind overhauls especially bring so much life and beauty to both games, while still fitting in pretty seamlessly with the feeling of the game. Thanks so much for all the hard work you've put in over the years Vurt! Thank you for all your work you have put in!!! I adore when games have immersive, realistic nature for me to explore, so thank you for your passion and hard work!! Thank you for realizing your wonderful ideas and sharing them with the community. Without your mods the walks in Skyrim would be much colder and less immersive. You are a one who gives landscapes a soul. Hi Vurt I love your snowy trees from Skyrim, SFO was my first vegetation mod that I ever use and when I loaded my skyrim with your mod I was really surprise by the massive difference your lush forest made in my game though my frames were destroyed like 20 less fps, but I play with setting and grass option an manage to get stable 30 to 40 fps on dense forest areas and I was delight. I am now playing fallout 4 most of the time there are some nice vegetation mods for this game like boston natural surroundings and rutbelt flora but I long for a Commonwealth Flora Overhaul. Vurt sure made New Vegas a whole lot less boring. Thanks, man. Thanks for all your nice mods vurt, they are always must have. The note about amiga music was cool since that's generally pretty awesome even without modding as a second hobby with released output.